Ricky Ray Taylor’s Punches and Prayers chronicles a boxer’s life from Mississippi to Manhattan. Ricky Ray Taylor is a colorful character, a man with powerful charm that easily disarms the most combative of hearts. He does this in his short, fast-paced memoir, Punches and Prayers: a fighter’s journey from the Gulf Coast to the Big Apple (Christian Faith Publishing, Inc.). In 206 pages he condenses 49 years of life, explaining how, while growing up in a family of traveling entertainers who eventually settled in Gulfport, Mississippi, he became an amateur boxer who ended up graduating from the U.S. Olympic Education Center at Northern Michigan University and developed into a successful trainer of White-Collar boxers in Manhattan. Ricky, whose training service is called Boxer DRILLZ, Inc., started boxing because his dad, Jerry Ray, was slow in bringing him to register for little league. Too late to sign up for the 1981 baseball season, Jerry Ray Taylor took Ricky Ray and a friend to the nearby boxing gym, thinking it would be a good summer activity for his son. Ricky Ray ended up becoming a well accomplished boxer on the national level, eventually gaining full ride scholarship status at the Olympic Training Center at NMU. Ricky Ray earned his BS in Communications with a minor in business from NMU in 1992, became a Boxing trainer and official in 1997, and has been a trainer in New York City since 2000. The tale of his journey is compelling, told in an accessible tone that will entertain any reader, irrespective of one’s level of interest in boxing. As a boxer of the same era myself, I greatly appreciate its authenticity. Furthermore, Ricky Ray Taylor’s witness to his faith is expressed in a respectful manner that avoids condemnation of others and invites both believers and nonbelievers into the shared experience of human joys and sorrows. 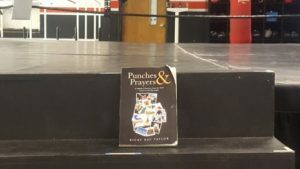 True to its subject, Punches and Prayers is structured in chapters titled Round 1 through Round 12, each of them revealing specific phases of life for the author. He describes the dingy, hot gym in which he began boxing as a boy of 12, where volunteer coaches oversaw boys and young men—many in need of father figures and most of whom were subject to poverty—and made due with a makeshift boxing ring and aging equipment in Gulfport. He describes how his father—a stand-up comedian, actor, fix-it man and inventor, as well as a business-manger and promoter who handled the career of Ricky’s mother, a professional dancer and actress from a Filipino immigrant family—traveled with them and his sisters around the United States, performing in nightclubs before eventually settling in Gulfport. He also describes the confidence he gained boxing, his successes and failures, his desire to fight professionally and the changing of his dream to a less violent way of life, as well as his struggles with anger, vices, and self-doubt that eventually led him to a faith in God that brought him back to sharing his boxing skills with others. His arrival at this vocational destination came, thankfully, from what is so essential in his life—family, rooted in his faith in God. He came to New York in 1999 at the invitation of his sister, allowing him a place to stay while working as a cell phone salesman as he slowly ventured into the New York City Boxing Trainer’s world. In Round 12 he describes the experience of September 11, that day in 2001 that changed the world and so traumatized our nation, becoming a pivotal point for him that finally pushed him full-time into the Boxing business. All of these experiences and many more are packed into Punches and Prayers, but for the sake of brevity there is no time and really no need to go into them here. Rather, it is left for you, the reader, to go a few rounds with Ricky Ray Taylor. Do it. You’ll enjoy the read and you’ll have more than a few laughs with a man whose words reveal a kind heart and a tender concern for the tough world in which we live.